Wed., September 5, 2018 12:12 p.m. | Wednesday, September 5, 2018 12:12 p.m.
One of the most anticipated super hero movies — “Captain Marvel” — got a major boost Wednesday when Entertainment Weekly posted a first look at the film on social media. The magazine tweeted out its latest cover, featuring Brie Larson as the Marvel hero. The issue, which hits newsstands Friday, will include exclusive first-look images and an interview with Larson and co-director Anna Boden. The film has Larson playing Carol Danvers, a 1990s Air Force pilot. During an accident, Danvers’ DNA is fused an alien’s, giving her superhuman strength, energy projection, and the power of flight. It will include a younger Nick Fury (Samuel L. Jackson) — with use of both of his eyes. It also stars Clark Gregg as Agent Phil Coulson and Jude Law as Mar-Vell, Danvers’ mentor. 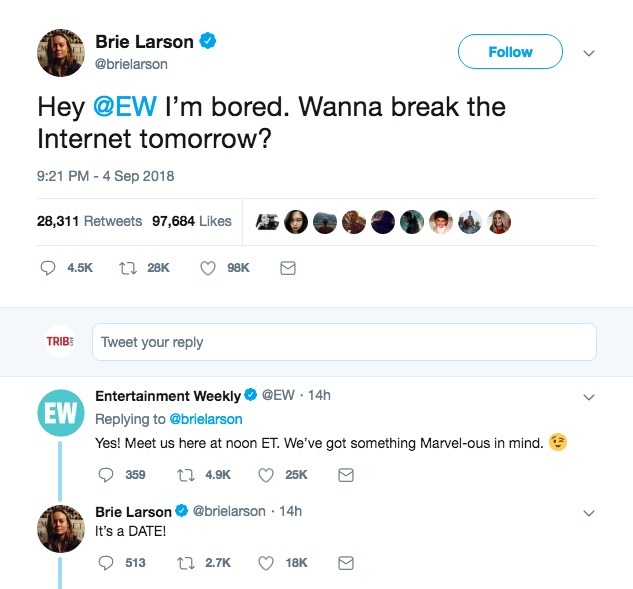 On Tuesday, Larson alerted fans that she and EW would be posting something on Wednesday. The film, directed by Boden and Ryan Fleck, is set to premiere in March 8, 2019. The fourth “Avengers” is scheduled to hit theaters May 3, 2019.